In-depth movie reviews of Chinese movies by a possibly naive (but very enthusiastic!) American fan. Enter the awesome world of Hong Kong produced Chinese movies! 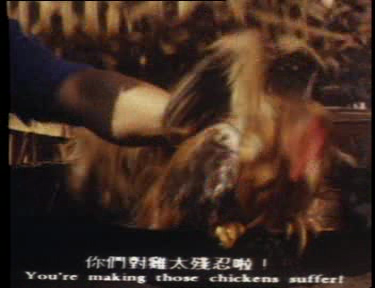 So I was enjoying Tsui Hark's crazy cannibalism movie, We're Going To Eat You. (You can read my full review of the film here). I thought: "Cannibalism? This would be a great film to post a companion recipe to!" 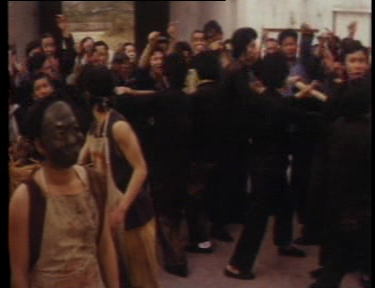 As you might expect, there's a lot of evil, badass cooking in a Tsui Hark cannibalism film. Most of this cooking involves ingredients like "people" and "people by-products." But at one point they decide to make chicken soup instead. Badass Evil Cannibal Chicken Soup! These cannibals are hungry. Not only that, they're badass! They don't want ordinary chicken soup. No, they want Badass Evil Cannibal Chicken Soup. Yum Yum! How is this made? Read on! Heat up a very big wok. Make it really hot. Put in some water. This will become the "soup" part of the Badass Evil Cannibal Chicken Soup. Take a whole bunch of live chickens. Don't bother killing the chickens, or cutting them up, or even taking their feathers off. Put these chickens into the wok. 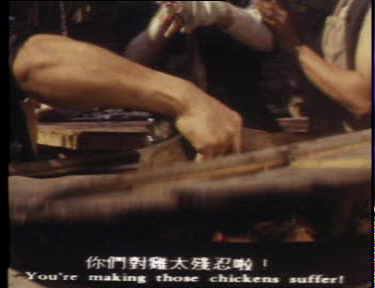 "You're making those chickens suffer!" In case the audience is really stupid, Tsui Hark points this out to us. Put a lid on the wok. Hold it down tight! The chickens might want to get out. Yeah, we got that the first time. Wait until the clucking stops. Then enjoy your delicious Badass Evil Cannibal Chicken Soup! Disclaimer: This is not a real recipe. (Well, probably not. Who knows.) Either way, don't actually do this! Yeah, it was in the movie. But do you do everything you see in movies? Besides, you would definitely be making those chickens suffer! I'm an ordinary American guy who grew up on Hollywood movies, but fell in love with Hong Kong Chinese movies because of how fresh and weird and different they were from Hollywood's formulas. All the text content on this site is copyrighted to Eric S. All rights reserved. Picture Window theme. Powered by Blogger.